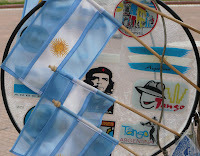 This photo is of the wares of a souvenir vendor in the Plaza de Mayo, Buenos Aires political and free speech heart. It is also where Evita entreated Argentina not to cry for her and a major sightseeing stop. This vendor offers flags, tango mementos and a little bit of Che (who was born in Argentina), hoping to offer something to every tourist's taste. I think he also had a table full of mate gourds and tea as well. More on Plaza de Mayo later.